Bloom in Sarah's Creek The discolored water of a 'red tide' in Sarah's Creek near the mouth of the York River. Samples taken nearby exhibited extremely high cell counts of the dinoflagellate Alexandrium monilatum, up tp ~100,000 cells per milliliter. Photo by VIMS professor Wolf Vogelbein. Bioluminescence Bioluminescence on shoreline rocks on the waterfront in Seaford near the mouth of the York River in lower Chesapeake Bay. Photo by Dana Torres of Seaford. Researchers at the Virginia Institute of Marine Science continue to monitor a large but patchy bloom of harmful algae in the York River near VIMS. 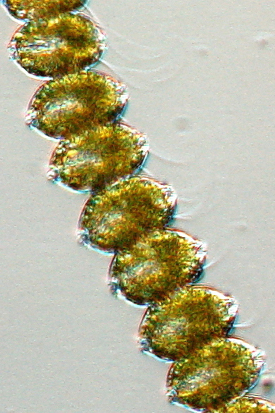 The bloom is dominated by a single-celled protozoan dinoflagellate called Alexandrium monilatum. This is a different species than Cochlodinium polykrikoides, the dinoflagellate associated with the bloom that discolored large areas of lower Chesapeake Bay from mid-July to mid-August. The current bloom began around August 22nd, similar in timing to the onset of A. monilatum blooms in the York River during the past few years. A. monilatum was first conclusively detected in Chesapeake Bay in 2007, when VIMS professor Kim Reece and colleagues used microscopy and DNA sequences to identify it as the dominant species of a bloom that persisted for several weeks in the York River. Earlier reports of Alexandrium in the Bay, from the mid-1940s and mid-1960s, do not clearly identify the species as A. monilatum. Reece, a member of Virginia’s Harmful Algal Bloom Task Force, says the current bloom is cause for concern, but notes that there have so far been no reported fish kills or human-health effects. She notes that any questions related to the bloom’s possible effects on human health should be addressed to the Virginia Department of Health via Virginia's toll-free Harmful Algal Bloom hotline at 888-238-6154. The line is available 24-7. 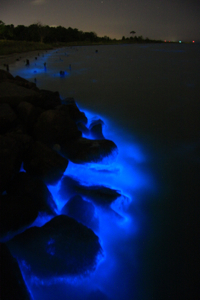 Alexandrium monilatum is a chain-forming dinoflagellate that has been reported for decades in blooms along the Gulf Coast and the southeastern U.S. coast, primarily in Florida, where it has been found associated with fish and shellfish kills. The organism is known to produce a toxin called goniodomin A, but the toxin’s potential impacts to marine life and human health remain largely unknown. Experiments done in the laboratories of Reece and professor Wolfgang Vogelbein at VIMS have demonstrated that exposure to A. monilatum cells, both whole and broken, causes mortality in their test organisms, the brine shrimp Artemia salina and larvae of the native eastern oyster. VIMS scientists have also experienced impacts to experimental animals exposed to York River water during blooms. Large numbers of Rapa whelks in flow-through aquaria died during the bloom of 2007, and during the summer of 2008 a similar die-off of cownose rays occurred. Reece and colleagues continue to monitor the distribution and density of the bloom, which have varied widely over the last few days. Cell counts from the “bloom” samples have varied from as low as 13 cells per milliliter to as high as 30,000 cells per ml, with intermediate counts of 170 cells per ml and 13,000 cells per ml as well. A 1-liter soda bottle holds 1,000 milliliters. Many of the samples collected from the York River during this bloom also contain cells from several other algal species, including Prorocentrum micans, Akashiwo sanguinea, Ceratium furca, Scrippsiella trochoidea, Gyrodinium instriatum, Karlodinium veneficum, and Cochlodinium polykrikoides.